I’m loving my crockpot as I’m settling into the house where Squish will be born (Squish is the nickname we’ve chosen for our child in utero). Even after three weeks in we are not completely settled, and the crockpot has been a godsend. One pot meals, no fuss, little prep – so handy! This Curry Chicken is on the list for this week; it will provide an easy and tasty meal this week. Give it a go when you are short on time and don’t want to think about dinner at the end of the day; a little prep in the morning goes a long way! Place chicken in the slow cooker. Mix the coconut milk, tomato paste, garlic, ginger, curry powder, salt and pepper, red pepper flakes in a bowl and mix well. Add in peppers and onions. Mix all ingredients together to completely cover the chicken in the curry mixture. Cover and cook at low for 6-8 hours. Mix all ingredients together and divide into 2 gallon freezer bags. To cook, remove from bags and place in slow cooker. Cover and cook on low for 6-8 hours. Recipe courtesy of my homies at Metabolic Effect! Chile verde is old school home food for me. Growing up in a Mexcian restaurant meant I had access to what I consider the best chile verde there is. I still have no idea what went into my father’s recipe, and I doubt it is even remotely healthy, but this cleaned up chile verde is pretty darn tasty in and of itself. Cube pork into bite-sized pieces. Sear pork in coconut oil until browned on all sides. Remove from heat and set aside. place tomatillos, poblanos, serrano, and garlic on a cookie sheet and roast in the oven at 500 degrees for 7-10 minutes. Let tomatillos and chiles cool. Blend tomatillos, chiles, cilantro, garlic, oregano, cumin, coriander, salt, pepper, and stock in a blender. Add blended tomatillos and chiles to the slow cooker. Add pork and onions to the pot. Cook on low for 6-8 hours. Mix tomatillo sauce, pork, and onions in a large bowl. Divide into Gallon sized freezer bags and freeze. To cook, remove from bag and place into slow cooker. Cook on low for 6-8 hours, or until pork is cooked through. It’s my first winter residing full time in Seattle since 2007. I’m digging the change in weather, relishing the crisp, fresh air and the need to wear scarves beyond SoCal Winter Fashion. 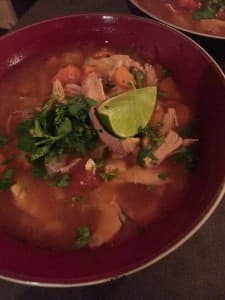 It’s soup season – a time of year I largely abandoned in my years in San Diego. Now that I have my ultra-nifty-super-incredible crock pot/slow cooker Multi-tasking Machine of Doom I am playing with throwing everything in the pot and stepping away. The night I made this I was exhausted and suffering from low blood sugar. This is a nightmare position to be in when you are wanting to stick to any dietary plan because your biology will want to take over and force you to call in a pizza or chinese food. To make this meal as quick as possible, I used a rotisserie chicken and my pressure cooker setting. Dinner in 20 minutes? HELL YES. Take that, Domino’s! Peel the meat from the rotisserie chicken and set aside. The skin and bones can be saved for bone broth, which is highly nutritional and very easy to make. Grab your Instant Pot and add the broth, chicken meat, diced veggies and seasonings. Cook under pressure for 20 minutes and serve, topping with diced, fresh cilantro and lime juice. Mix chicken, carrots, onion, tomatoes, salsa verde, pepper, salt, cumin, oregano, paprika, and garlic together. Pour into a Gallon Freezer and freeze for up to 3 months, removing extra air from the bag as you seal it. Remove chicken from bag and place into pressure cooker. Add 1 quart of chicken broth. Attach lid and set to manual for 20 minutes on high pressure. Serve with fresh lime and diced cilantro. Stovetop: Remove chicken from bag and to a stock pot with one quart of chicken broth. Cook for 30 minutes, or until onions and carrots are cooked through. Aztec Brownies – Gluten and Dairy Free! These brownies were a huge hit at a potluck I attended last night! No one could believe the secret ingredient was….BEANS! 2 tsp. true cinnamon (Ceylon cinnamon, or canela in the Mexican tiendas) Specialty spice stores will carry this. In a small bowl melt chocolate chips in microwave for 2 minutes. Stir until smooth. In blender or food processor, combine beans and eggs and blend until smooth. Add sweetener, spices, baking powder, and melted chocolate, process until smooth. Pour batter into a 9″ or 8X8″ well-greased pan. Let cook completely before slicing (as chocolate cools, it keeps the bars from being too crumbly). Pour batter into a large ziploc baggie and freeze. Let thaw the evening before baking. Pour thawed batter into a well-oiled 9″ or 8X8″ well-greased pan. Bake for 45 minutes or until edges pull away from baking pan. Let cool completely before slicing to prevent crumbling.